So, you have a Facebook page for your podcast, now what? Have you considered also creating a Facebook group to strengthen and engage your community of podcast listeners, with the ultimate goal of converting them to paying customers? 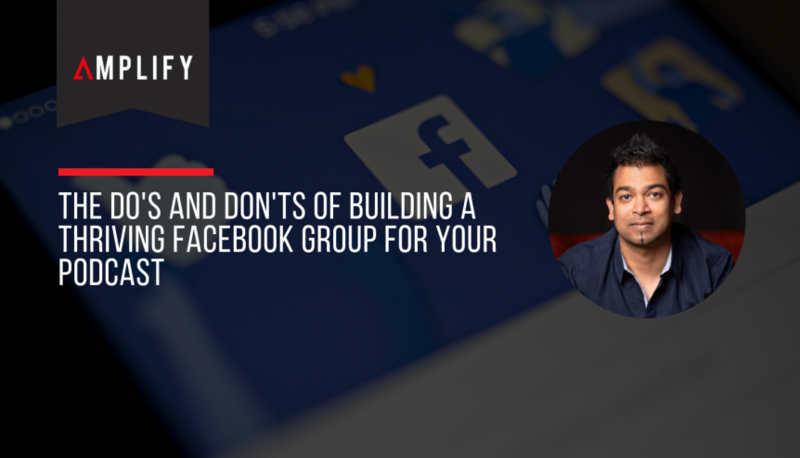 Take a look at these do’s and don’ts when starting and managing your Facebook group so it can become one of your most valuable social media tools. We all want to avoid the dreaded Facebook group where you end up being the only person posting and commenting. We also don’t want our group to become a big promo fest and no fun either. So, think thoughtfully about setting the tone. One strategy to try is to have theme days; for example, Wednesday is promo day, which is the only day of the week reserved for everyone to promote themselves. Theme days can drive and trigger specific conversations, giving a structure to this digital space. Use pinned posts as an onboarding mechanism for new members that states your guidelines to maintain your cultivated culture. In your desire for increasing the number of members in your group, don’t add your Facebook friends if they don’t want to join. It’s the equivalent of pushing spam content on them. This tactic can also backfire as it can cause huge rants from members who didn’t willingly join. Remember your goal is to foster an engaging community. That means it’s not all about you! Although you may be the Facebook group administrator and leader, think about embracing the shared leadership model. For example, if someone in the group asks a question, even if you know the answer, tag someone who specialises in that area to prompt them to answer. This opens the conversation and demonstrates to all group members that they can make useful connections. People also like it when recognised for their expertise. This helps create the vibe of a community of friends who will help each other out. If you start or join a Facebook group, please do everyone a favour and don’t only utilise the platform as a way to promote yourself. Even worse, don’t show up in someone else’s group to promote your own Facebook group without the leader’s permission. Some will allow that cross-promotion, but many people hate the tactic. The key to creating a Facebook group for your podcast is to start with connection, conversation and community in mind. Not conversion. The opportunities for conversion will come, if you start off in the right way. Do you need help in better understanding your target audience? Do you struggle to come up with content ideas that will help you improve your sales? If so, be sure to check out our Content Amplifier for a fast and effective way to get your marketing strategy moving today. Listen to the entire episode here.